Week after week of the same-o same-o has me somewhat in a rut. Completely uninspired, I haven't even really been blogging much with several posts in the queue barely written. C'mon, there is only that many adjectives available for Chinese food, Banh Mi and Dim Sum. *Yawn*. It's almost mind-boggling how people boast about Vancouver's gastronomical diversity. What diversity? If it is purely about Asian food, then yes, we have tonnes of that. But after my visit to San Diego, I have settled back into my pattern of late night Asian food, Dim Sum on the weekends and more Asian food for my other meals. It has become so routi ne that I was on my way for some wonton noodles and congee when suddenly a light went off. No, it wasn't the cops nor was I taking photos whilst driving. Rather, I'd had enough. No more noodles! I quickly took a turn into New West and headed to a Mexican restaurant I had passed by a few months ago. 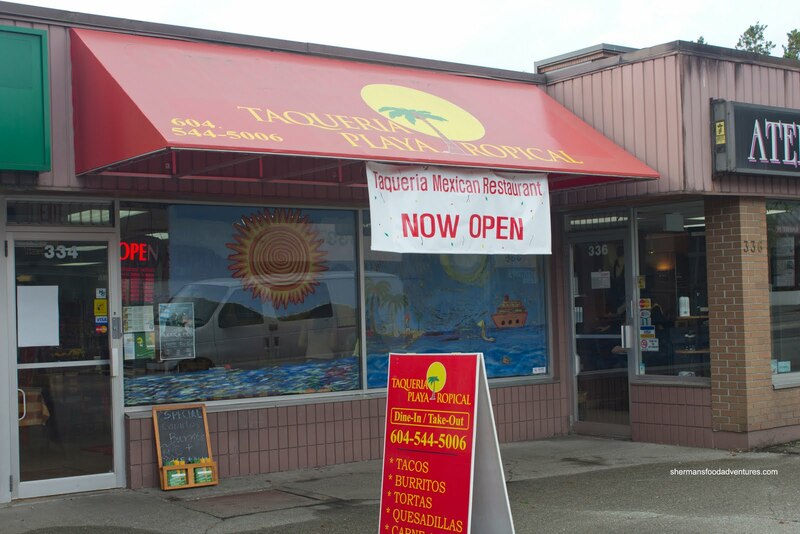 Just a few steps from my favourite dive, Burger Burger, Taqueria Playa Tropical serves up Mexican food not found at Taco Bell nor Taco Time. For me, that is a good thing. 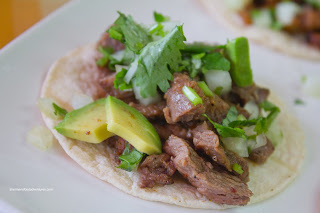 As much as I don't mind making the occasional Old El Paso family meal, I'm not a fan of Americanized (corrected from North American) Mexican food. So what does an authentic Mexican restaurant serve in place of the 99 cent hard taco with mystery meat and various sauces? For starters, their "tacos" are soft and the ingredients are discernible cuts of meat. 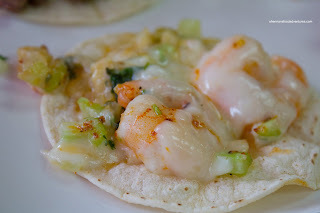 I decided to try four of them beginning with the Camaron (shrimp, garlic, celery, onion, cilantro and melted cheese). This my friends was a good taco. With a fresh snap, the shrimp popped in my mouth bursting with sweetness. The crunch from the fresh onions and celery added texture as well as some brightness (if that makes sense...). The melted cheese wasn't only a bystander, there was good flavour as well. My only complaint, and that goes for all the tacos, would be the single soft taco. Considering the amount of ingredients they put on top, there really should be 2. Next was the Carne Asada (grilled steak, onion, cilantro and avocado) which was full of beautifully textured steak. The meat was moist and flavourful, yet could've benefited from some more charring. I did detect some smokiness though. 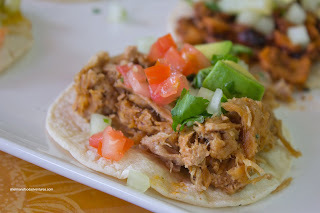 Of course I wouldn't pass up the classic Carnitas (slow cooked pork, avocado, tomato, onion and cilantro). Once again, there was a generous amount of meat, which was not oily or drenched in liquid. This was a fairly neat carnitas taco. Despite the lack of moisture, the meat was moist and tender. I would've liked it to be more aggressively seasoned, yet there was still a nice rich pork flavour. Lastly, I also tried the Al Pastor (marinated pork, onion, cilantro and pineapple) which was probably the most flavourful of the bunch. The meat was predictably more chewy than the rest, but that is normal due to the cooking process. It wasn't dry though. There was a good mixture of spices which was complimented by the sweet pineapple (which was canned, but I didn't mind). While looking over the menu, the one thing that caught my attention was the Menudo Rojo. That my fellow food lovers, cannot be found that readily in the GVRD. 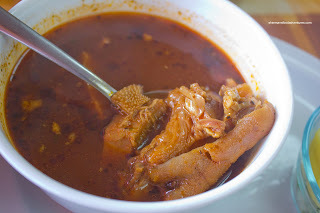 This is a Mexican soup consisting of beef tripe, tendon and cow feet in a red chili base broth. Since I'm a big fan of offal and anything that is interesting, I had to order it. There was a good amount of ingredients in the soup with the tripe and tendon being soft and very easy to che w. Same could be said about the cow foot as well. There was just the right amount of gaminess which added depth to the soup. There was a mild level of heat (for me at least), however, I found that they were a bit too aggressive with the salt. In the end, I could've had another order of the soup if I hadn't gotten the Choriqueso Torta as well. Hey, menudo is traditionally served with bolillo bread anyways... For $6.50, I found it a fair price considering that Las Tortas will charge you $10.00. There was lots of flavourful (if not a bit mild) Mexican chorizo, melted cheese, avocado, tomato, cilantro and onion packe d in the soft bun. 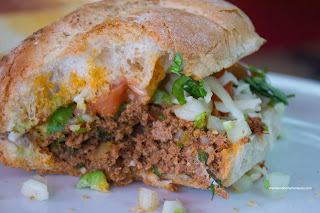 Other than the lack of spice, this was a good torta. Alright. I'll admit it. I enjoyed my meal at Taqueria Playa Tropical. Despite my indifference towards Mexican food, the stuff here was both interesting and tasty enough for me to plan a revisit. Of course not everything was perfect, but what is really. 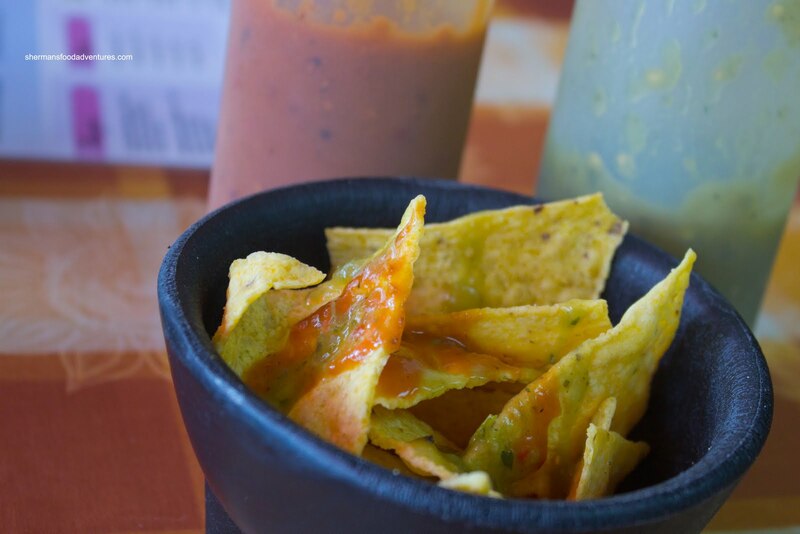 The bottom line is that the prices are pretty decent and the eats are not merely a passing attempt at Mexican food. My sister went and said the portions were smaller than Dona Cata/La Taqueria but more expensive, and yea, the single taco is really strange, not on par. I think I'll visit during one of my lunch breaks, that torta looks good. I visited this place a few weeks back too. Nice to read your thoughts on it! @Kevin Yah, I suppose the value may not be as good, but I thought the food was more than acceptable. I need to go to Burger Burger again though! @shokutsu Did you like it? Glad to see you liked this place. I've definitely enjoyed my visits there so far. And I do enjoy your reviews. Just wanted to throw out there that Mexico is in North America. You mentioned that you didn't like "North American Mexican food". 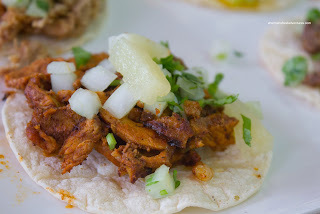 Let's not forget that authentic Mexican food is North American. Unless of course you prefer the versions of Mexican food that they produce in some other continent, like Eurasia or Africa. Very good point. I guess what I should have said was Americanized Mexican food or Tex Mex.